Q: After yesterday’s phone call between the Chinese and ROK heads of state, the ROK side will send a representative to the Belt and Road Forum for International Cooperation and to discuss with China international and regional issues of common interest. 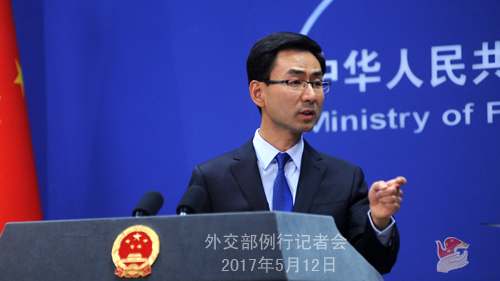 What is China’s expectation for the visit? Can you tell us the relevant arrangements? A: Lawmaker and former Deputy Speaker of the ROK National Assembly Park Byeong-seug will come to China to attend the Belt and Road Forum for International Cooperation as the representative of the ROK government. China and the ROK are in communication on the relevant arrangements for the visit. You mentioned that he will exchange views with China on other issues of common interest. According to what I know, the main purpose of his visit is to attend the Belt and Road Forum for International Cooperation. As for the conversation between the two leaders, both sides have released relevant information. I would like to say that China and the ROK should work together and meet each other halfway to bring the China-ROK relationship back to the track of healthy and steady development at an early date. Q: Sri Lankan officials say that Sri Lanka has denied a request by China to dock a submarine at Colombo port next week. 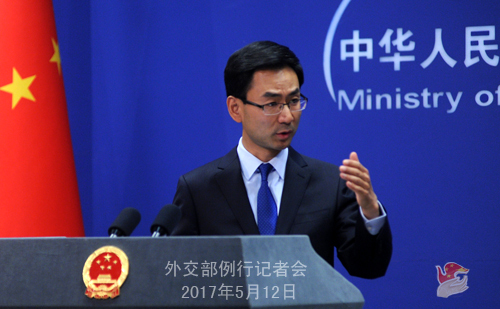 Has China expressed its dissatisfaction with the Sri Lankan government about that? A: I just saw that report. You can ask the Ministry of National Defense for more detailed information. China and Sri Lanka enjoy traditional friendship. We maintain sound political, business, cultural and military cooperation. Q: According to some reports, yesterday the draw ceremony for group events of the Universiade was held in Taipei. The delegation of the mainland left before the draw. Is the mainland not going to participate in group events? Why is that? A: Your question is not about foreign affairs. You should ask relevant authorities for more information. Q: Is there any word from India about who will represent it at the Belt and Road Forum for International Cooperation? And what is the composition of the delegation from Nepal? A: As far as I know, there are Indian scholars participating in relevant activities during the Belt and Road Forum for International Cooperation. As for the participation of Nepal, currently I do not have any information to offer. I can inform you later when I get the information. Q: Who is representing the US at the forum? A: The Belt and Road Initiative is open and inclusive. We welcome the attendance of all parties. To my knowledge, Mr. Matt Pottinger, Special Assistant to the President and Senior Director for Asian Affairs of the National Security Council, will lead a delegation to attend relevant activities of the forum. Q: A senior civil servant from the Australian Defense Department said today that it is no secret that China is very active in intelligence activities directed against Australia. He also said that the Chinese government keeps a watchful eye inside Australian-Chinese community. Are you aware of these comments? What is your response to that? A: I do not know the situation you mentioned. I just want to make a brief response: we hope relevant people in Australia can say and do more things that are conducive to the growth of China-Australia relations and closer cooperation between the two countries, instead of making irresponsible remarks. Q: I have a follow-up question on the visit of the Chinese submarine to Sri Lanka. Reports say that the visit is not going to take place this month. In the future, is China still interested in raising it with the Sri Lankan side regarding port calls by the PLA navy? A: I suggest you ask the Ministry of National Defense for more information on this question. I just said that China and Sri Lanka maintain friendly relations. Q: You said yesterday that more than 4,000 journalists were accredited to come to the Belt and Road Forum. How many international media are coming? How many foreign journalists were accredited? A: The latest figure I have is that nearly 4,500 Chinese and foreign journalists have registered to cover the forum. As for how many of them are Chinese and how many are foreigners, you can ask the main media center of the forum for more information. As I said yesterday, we have a main media center at the National Convention Center, which has been put into operation from 8 o’clock this morning. You can ask the media center for detailed information, such as the arrangements of activities and the number of journalists. Also, during the forum, there will be many press conferences and briefings held by the media center. Your interest and attention will be very much welcomed. For details you can visit the official website of the media center www.brfmc.org. Q: You just talked about the participation of the US representative at the Belt and Road Forum for International Cooperation. Previously, China also announced that Italian Prime Minister Gentiloni and Spanish Prime Minister Rajoy will also attend the forum and provided information about the attendance of the British and German sides. We also want to know if there are representatives from countries like France and Japan. Do you have any updates on that? Also who will represent the EU? A: I just talked about the participation of the US. Foreign Minister Wang Yi said in the previous briefing that Italian Prime Minister Gentiloni and Spanish Prime Minister Rajoy were confirmed to attend the forum. Leaders of the UK and Germany expressed positive attitude to attending the forum, but will not be able to make it due to domestic political schedules. Therefore, the UK will send Chancellor of the Exchequer Hammond as the special envoy of Prime Minister May, while Germany will send Minister for Economic Affairs and Energy Zypries as the special representative of the federal government and Chancellor Merkel. As for France and Japan, according to what I have learnt, former French Prime Minster and Chairman of the Senate Committee on Foreign Affairs, Defense and Armed Forces Jean-Pierre Raffarin will lead a delegation to the forum as the representative of the French President. Secretary-General Toshihiro Nikai of the Japanese Liberal Democratic Party will lead a delegation to attend relevant activities of the forum. Also, Vice President Jyrki Katainen of the European Commission will attend relevant activities of the forum. Q: I asked yesterday if you had any details about Spanish Prime Minister's visit and meeting with the Chinese side, and you said that you were still making arrangements. I am just wondering if you have any updates on that. A: As I said yesterday, there are many distinguished foreign guests attending the forum, we are still making overall plan for them to have meetings or talks with President Xi and other Chinese leaders. According to the usual practices, we will release relevant information about the meetings and talks in a timely fashion. Spain is China’s good friend and important cooperative partner in the EU. It enjoys unique geographic and economic advantages in participating in the building of the Belt and Road. China welcomes the attendance by Prime Minister Rajoy. We believe that his attendance will further deepen our practical cooperation in various areas within the Belt and Road framework and promote further progress in the China-Spain comprehensive strategic partnership. Q: We also saw a release from the US government that China and the US have reached a ten-point agreement on the 100-day action plan for economic cooperation. Can you confirm this? What might come up to further this plan? A: This noon, officials from relevant departments of China have held a briefing to give a comprehensive introduction of the early harvest of the 100-day action plan. You can find very detailed information on the Internet. As we have stressed time and again, China and the US have very close business ties, which in its nature is mutually beneficial. 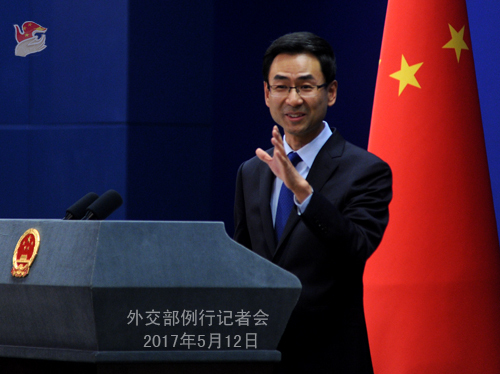 That both sides agreed to promote the 100-day action plan within the framework of China-US comprehensive economic dialogue and had so many achievements in such a short time shows that as long as we follow the spirit of mutual respect and win-win cooperation, we can properly address differences and deepen cooperation to deliver more benefits to the two countries and two peoples. Q: Where can we find the entire list of participants to the Belt and Road Forum? Is there a place on the website that probably you will release the list? A: I know that all of you are very interested in the Belt and Road Forum for International Cooperation. But the list of participants keeps changing. For example, the participation of the US, France, Japan and the ROK is the latest update. The main media center of the forum started operation this morning. I suggest you ask them those specific questions including the participation of countries. Q: Does President Xi have any plan to meet and hold talks with all the 29 heads of state and government attending the Belt and Road Forum for International Cooperation? A: As I said, we have many distinguished foreign guests attending the forum, so we are still making arrangements for meetings and talks between the Chinese leadership including President Xi and foreign guests.